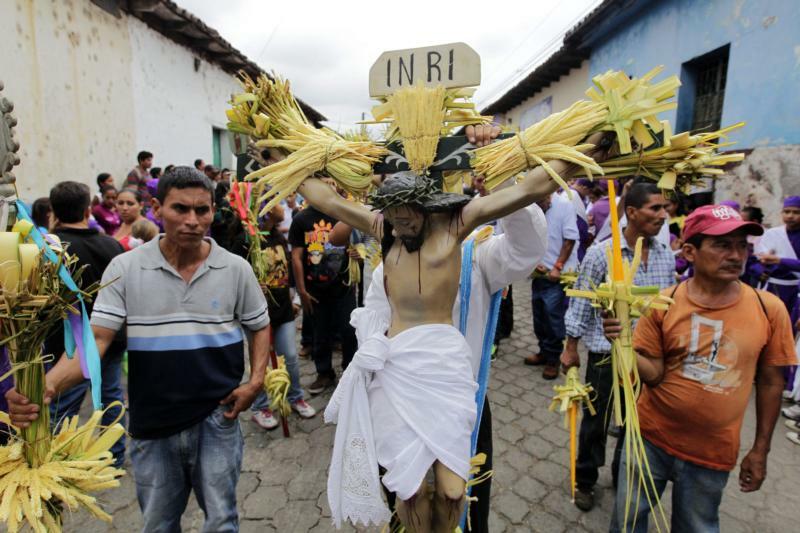 SAN SALVADOR, El Salvador (CNS) — Police in some Salvadoran cities have already begun patrolling in an effort to prevent violence during Holy Week processions. Some church officials say the church has been caught in the crossfire of gang violence in a country with one of the highest murder rates in the world. “Gang members do not care to attack someone who is praying in the Via Crucis, they just don’t care where the target is,” Father Ricardo Arcega, pastor of St. Peter the Apostle Parish in San Pedro Perulapan, 13 miles northeast of San Salvador, told Catholic News Service. In April 2014, Marco Tulio Mejia, 23, was shot on Good Friday while participating in a Way of the Cross procession organized by St. Joseph El Espino Parish, not far from Father Arcega’s church. Mejia, allegedly a gang member, survived, but lost an eye. A 50-year-old woman was also injured in the shooting. “It had always been said that those gang members who start visiting the church or participating in other religious activities wouldn’t be killed, but I think that has passed into history,” said Father Arcega, a Spaniard who has lived in El Salvador for 17 years. The procession was suspended after the incident. The attack was allegedly perpetrated by members of Barrio 18, one of the two main gangs in the country. Father Arcega added that during this year’s Holy Week festivities, young people who like to participate in processions in San Pedro Perulapun are aware that there are neighborhoods where it is better not to go, as a precaution. El Salvador faces an acute problem of murders, largely as a result of the war over territory fought by the country’s two main gangs, the Mara Salvatrucha or MS13, and Barrio 18. In order to avoid shootouts between rival gangs, the parish of Our Lady of Asuncion in Paleca, a crime-ridden barrio in Ciudad Delgado, is planning multiple processions during Lent. This is so that gang members do not have to cross into neighborhoods controlled by rivals. “We have to carry out the processions separately, although I would like to have only one … that’s the kind of thing we need to do to keep some kind of peace in that place,” Father Gregorio Landaverde, parish priest, told Catholic News Service. In the early 1990s, young Salvadorans living in the United States formed gangs and, once deported to El Salvador, brought the gang culture home. The country ended 2015 with 6,670 murders, representing a rate of 104 homicides per 100,000 inhabitants, one of the highest in the world. The U.N. Office on Drugs and Crime reported a global average intentional homicide rate of 6.2 per 100,000 inhabitants for 2012. The Salvadoran bishops’ conference issued a statement Feb. 4 to express its concern about the widespread violence in the country. “As pastors, although we feel powerless in this situation, we cannot remain silent, for the sacred value of human life is being increasingly violated,” said the bishops. In addition to fighting each other, the gangs are targeting police officers; 62 were killed in 2015. One of them was Hector Wilfredo Alfaro, 42, an off-duty officer murdered while participating in the Holy Thursday Procession of Silence in San Juan Opico. In 2012, shootings were also reported during Holy Week activities in Tonacatepeque and Ilopango. In 2013 in Nahuizalco, three youths linked to gangs were shot dead a few steps from where preparations were made to start the Good Friday Entombment. Other religious celebrations were also hit by gang attacks. On Feb. 4, a young man was shot dead during the annual pilgrimage that hundreds of residents of Candelaria make to San Pedro Nonualco to celebrate its fiesta. “I do not know the details of the crime, I do not know which group did it, although it is very well known that gangs are fighting to control the territory,” Father Pedro Aranzamendi, pastor of Our Lady of Candelaria Parish, told Catholic News Service. In Paleca, Father Landaverde said he is running a project to give young people opportunities to learn a craft and get a job. “The best way to stop young people from getting into violence is giving them a chance to change,” he said.